Video: College of DuPage meteorology professor Paul Sirvatka talks about the coming weather. The Chicago area got walloped with 3 to 7 inches of snow Sunday night into early Monday morning, according to the National Weather Service. At O’Hare International Airport, about 790 flights were canceled Monday morning; about 220 canceled flights were reported at Midway International Airport. As that snowfall moves out of the area, record cold and wind chills are forecast to move in starting Monday night. Temperatures will be around 3 to 5 degrees by 7 a.m. Tuesday, and temperatures will continue to drop throughout the day, Fenelon said. More: Track Chicago’s snowplows as they move across the city. 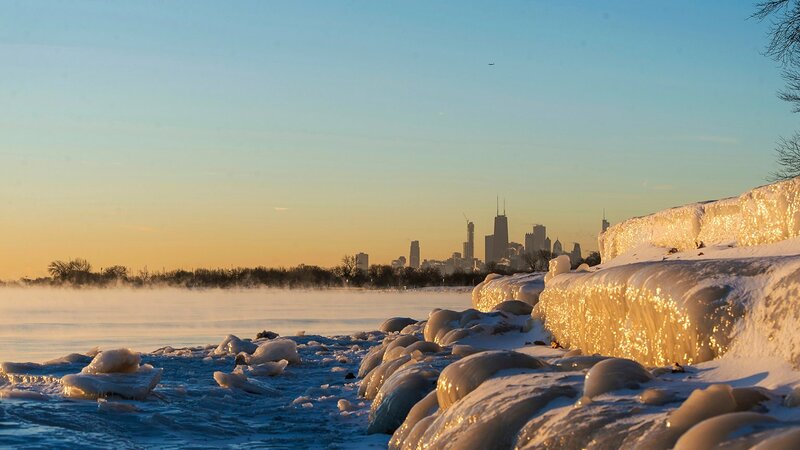 The coldest daytime high temperature recorded in Chicago is minus 11 degrees, which occurred Dec. 24, 1983 and Jan. 18, 1994, according to Fenelon. The average daytime high for this time of year is 28 degrees, and the average low is 17. The subzero temperatures will persist through midday Thursday. In addition to extremely cold temperatures, the NWS is warning about wind chills that could reach 30 to 50 degrees below zero. “This combination of temperatures and wind chill can lead to incredibly rapid onset of frostbite and hypothermia,” said Fenelon. Frostbite to exposed skin could begin in as little as 10 minutes. “It’s important for folks to limit their time outside and dress as appropriately as they can,” he said, adding people should start preparing now by moving pets indoors and making sure they have adequate supplies in their homes and vehicles, such as extra batteries, blankets and first aid kits. (For more winter preparedness tips, check out NWS’ website.) Fenelon also advises checking on friends, family, neighbors and those who live alone to make sure they are prepared for the winter weather.